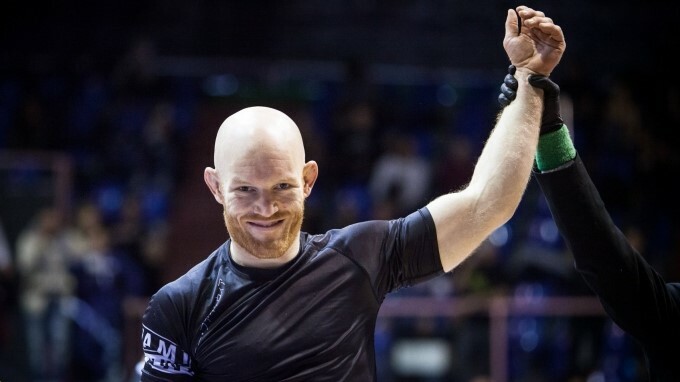 An Irishman has taken gold for the first time in the adult black belt division at the IBJJF European No-Gi Championships. Darragh O'Conaill of Dublin won the middleweight title at the 2018 No-Gi Euros on Sunday in Rome to earn the historic achievement. The gym owner and competitor had previously medaled twice at the tournament as a black belt, taking bronze in 2015 and silver in 2017. O'Conaill had to win three matches to capture gold in Rome. He won his first match against Arthur Puck of Alliance with a darce choke in less than a minute. "My next fight was with Teta [Eduardo Rios] from Frontline," says Darragh, who won 2-0. "I’ve actually fought Teta two times before. The first time he tapped me, the second he beat me 2-0, and now I got the win the other way around." O'Conaill met Finnish grappler Tuomas Ylinampa in the final, winning again by darce choke in under a minute. "It was a goal for me since I got my black belt," says O'Conaill, who had twice won the No-Gi Euros as a brown belt. "My first one at black in 2015 I lost to Teta in the semis, taking bronze. 2016 I couldn’t fight because Polaris was the same day. 2017 I got to the final after two submissions, losing to Isaque Bahiense by advantage in a very close fight. "So to win in 2018, after coming so close the previous year, and beating someone who beat me in the first attempt, really felt great. Probably the biggest win of my black belt career so far!"